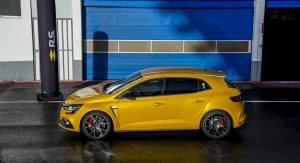 Customers in the UK can now order the Megane RS Trophy, with Renault announcing specs and pricing details of the most potent Megane yet. 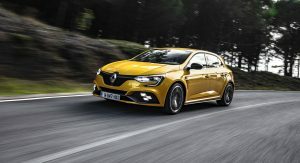 All Megane RS Trophy models come with the Cup chassis, which includes a Torsen limited-slip differential, 25 percent firmer dampers, 30 percent tighter springs and 10 percent stiffer anti-roll bars, as standard. 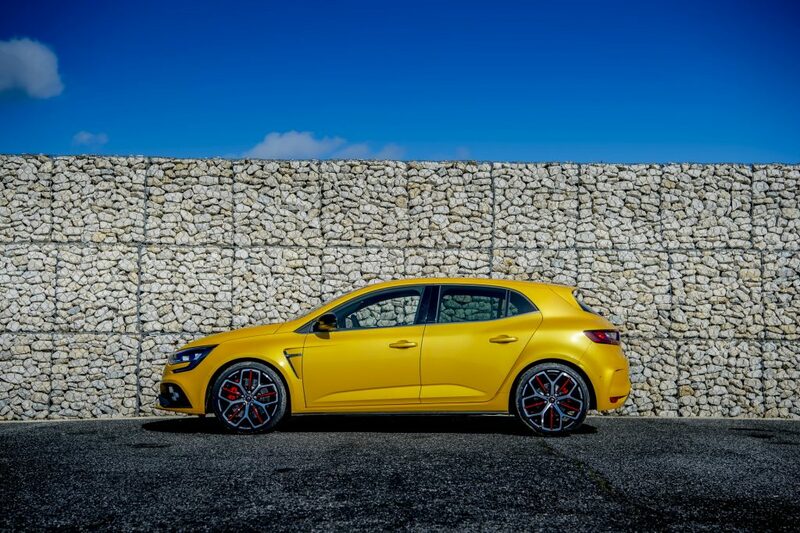 In addition, the front brakes are now 355mm discs with Brembo calipers, while there’s also a set of lightweight 19-inch Jerez alloy wheels that are 2kg lighter per corner compared to the standard Megane RS and are fitted with stickier tires. The biggest highlight of the Trophy, however, is the updated engine. 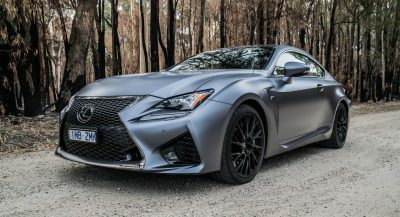 The turbocharged 1.8-liter four-cylinder is now producing 296hp (300PS) and 310lb-ft (420Nm) of torque, representing an increase of 20hp and 22lb-ft over the standard model. 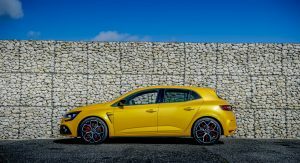 Renault Sport has also fitted the engine’s turbocharger with a new ceramic ball bearing system that reduces friction and allows faster spooling. There’s also a new exhaust system, which features a mechanical valve to adjust the soundtrack via the five different driving modes (Comfort, Normal, Sport, Race and custom). The 4Control four-wheel steering system that debuted in the ‘normal’ RS is also present. 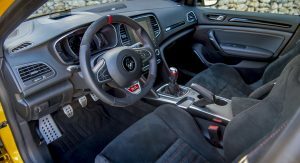 The interior can be fitted with a set of Recaro bucket seats that offer an up to 20mm lower seating position for a sportier feel behind the wheel. Standard equipment is generous and includes features like LED lights, rear parking sensors, dual-zone climate control, a seven-inch infotainment system, cruise control, and more. 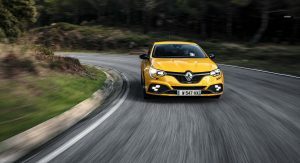 Pricing for the 2019 Megane RS Trophy starts from £31,810 with the six-speed manual transmission, while the dual-clutch EDC automatic gearbox costs an extra £1,700. I’ve got the old 250 cup. Now that’s a hard suspension. Driving the new cup was like a limousine in comparison. Wow so that means they really improved, i was fortunate to test drive the first 250 Cup and it felt stiff, less stiff than my Cupra, but based on my assumption, i thought it would be the same on the daily drive, and that Cupra rips the back. Got rid of the Cupra for a Clio 3 as i got an epic deal and my mrs drives that now. Renault make epic cars and i was a major VW fan. But this brand won me over with the speed and comfort. It has the right balance in my own personal experience. It’s an interesting car. As long as they stop calling them hot hatches. Why stop calling them hot hatches? Because those were just a tad bigger than small cars, most of them 2 doors. These are much bigger, heavier and all of them with 4 doors. I won’t comment on automatic transmission and other aids that impact their nature. Hot hatches were small and done with a certain spirit. They haven’t been hot hatches for quite a long time. The definition of a hot hatch is a sporty version of a normal hatchback no matter the number of doors, weight etc. The Delta is a hot hatch and it has 5 doors. The fact most had 3 doors is a coincidence that has to do with the trend of the day. Same with the weight. What you describe as the definition of a hot hatch is the subjective one. Objectively, it’s the one I mentioned before. In the past as well, they were just fast versions of regular hatches. They just happened to be 3doors mostly and lighter than today and you have associated the term with that. You have every right to do so obviously but factually, today’s hot hatches are hot hatches as much as those older ones. The Delta could afford being a 5door hot hatch not because it was simply the Delta but because there was no 3door version of the regular car. Today’s hot hatches don’t pretend to be anything they aren’t. It’s absurd saying they pretend to be lean and young. Also, regarding the price, adjusting for inflation I’m really not sure the older cars were much cheaper than today’s offerings. You still had to be relatively well off financially in order to afford a hot hatch. That’s why they’re so rare nowadays. It’s far than subjective. It was how hot hatches were conceived at that time. 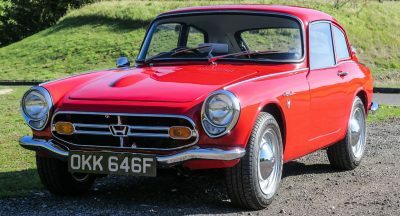 That reflected in how they were designed, built and marketed (having been an automotive translator, among other things, for quite a few decades helped). I don’t know where you live but as far as Europe was concerned, that was the paradigm at that time. The cars you are seeing now are far from being hot hatches. They are neither compact, nor light, and those extra doors make them much less sporty than they should look. 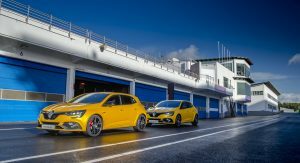 They are comfortable hatchback cars, with powerful engines but we’re far from the hot hatch concept. Maybe hatch GTs, (with too many doors), if we so wish. They win in practicality. Much less in doing what they should do. The second generation of HF was done 3 doors. Check for “second generation delta HF”. But again, they were conceived in that way because those were the normal hatches that they were based on. That’s why I say it was purely coincidental. The original Delta is the example that proves that. If the other ones were also 5door hatches, their hot versions would have 5 doors as well. I do live in Europe. Today’s hot hatches aren’t compact or light compared to the older ones indeed but in context they are. Now, you say they don’t win in doing what they should do. The serious FWD ones can challenge much more expensive sportscars and supercars around twisty roads. That’s exactly what the purpose of hot hatches always was and that’s what makes a hot hatch successful. So they do win in doing what they should do. They aren’t GTs, not by a long shot. They’re very serious, fast cars that corner incredibly well. They don’t feel as pure as the older ones (nothing does, in any category) but in every single other way they’re better. Have you driven any of the latest top fwd hot hatches? They’re very nimble actually because they have very quick steering racks and a very responsive front end. Engineering has in many ways made up for the added weight. Also, they don’t corner well because of electronics. It’s purely mechanical. Not yet. The last models were from early 2011 (mostly Renault, 1 TypeR). In Taiwan you only see Golfs and Fords in that segment. I like none of them. I am seriously considering an Impreza WRX. I prefer that ugly beauty to the 4 doors on a hatchback. Considering how bad traffic is, also an MX5 would do. The game has moved on massively since 2011. I hope you get the chance to drive the latest Type R or the Megane RS Trophy or the i30N. They’re quite proper. 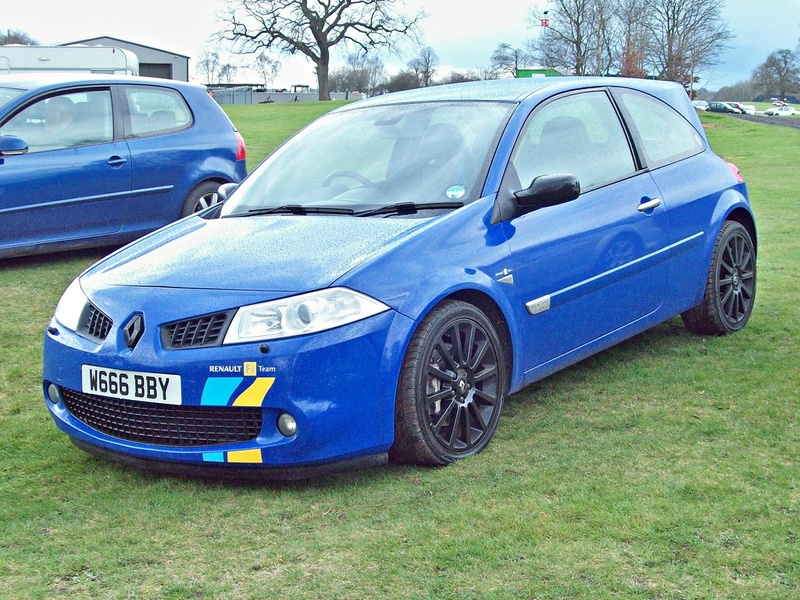 Renault Sport can do cars. Type R is an institution. I just don’t like the last model. Design is terrible. The choice would go to the Megane. Hyundai. I have translated a lot marketing material in Italian :-). I believe they did a good job. But not quite there with the others yet. Getting close. They won’t sell many in Italy because there is a stigma towards Korean brands. You don’t drive a Korean unless you don’t have enough money to get something else. I think the car is valid. It needs refinements. I have been too busy with else and no time to try recently. Another year of hiatus then I might buy something new. The latest Type R does look horrible but in terms of driving it’s the best FWD hot hatch right now. Easily. You’re right about the i30 although since it’s much cheaper than the rest in some markets it can do very well there because it seems to be great to drive. 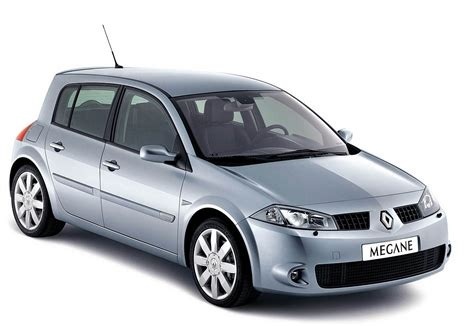 In Greece it’s approximately €10,000 cheaper than the Megane and maybe even 15 compared to the Civic. It’s great value for money. 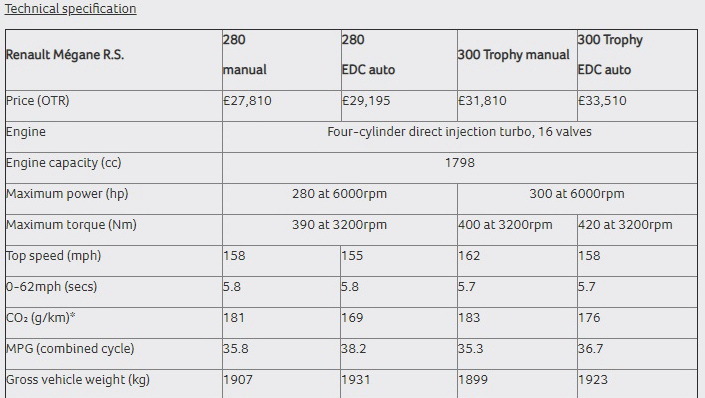 I currently own the Leon Cupra 280 and you can tell they benchmarked the i30 against that. They have too many things in common. They say the Hyundai is a little more raw, a bit wilder so I think that bodes well for it. It’s a little uninspiring inside but for 28k you can forgive that. The Leon is an under-rated car. They drive very well and they are nice. VW never managed to turn Seat into the sport brand of VW. But i’d buy a Leon over an Audi or a Golf. I drove some of them mid 2000s and they were very nice car with a very good handling. The Astra OPC for example had a very light tail that i never liked too much. They’re good value for money for sure. You can tell where they’ve saved money because they do have some quality issues but when the mechanicals in the Cupra specifically are those of much more expensive models you can forgive them. Sport hatchbacks. Certainly not hot hatches. Yeah, nah. What’s a goh hatch to you then? See my reply to Matt below. I’ll add a link later. Can’t now. Other than Golf, just about no one makes a 3dr in this class anymore. Besides, the class was never exclusively 3dr and some models you’ve posted were available with both 3 & 5 doors. Every car in every class has grown but I don’t think that means you can no longer call them a hot hatch. If you want something smaller look at one or two classes smaller. I believe you are misled. Let me try to explain. The segments to which hot hatches pertain are called B (small) and C (middle sized, mostly hatchbacks). Now, these two segments always existed with 3 and 5 doors. When it comes to “hot hatches” (and you can see the pictures yourself), very few models included back doors. They were even rarely depicted with extra doors because the typical user wanted a fast car with 3 doors. A sub-coupè that was also practical but not a “daddy car on steroids”. What they are doing now is exactly that. 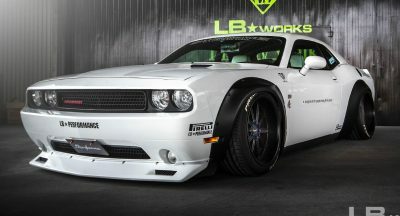 “Daddy cars on steroids”, normally with too many doors, too heavy and, yes, with lots of power but also too many aids that hot hatches never needed. I am not asking you to understand. Pretty sure you will read as “natural evolution of the breed”, something normal. But for others, hot hatches are lighter, with 3 doors, manual transmission (because they were used a lot on very narrow, hilly roads and you needed a handbrake and clutch to drive them properly) and a proper driver in most cases. What you are buying now are “civilized” versions. They should not be called hot hatches. They are simply peppery versions of segment B or C cars (The Bs are better). I own a 2011 RS250, so I’m well aware of what a hot hatch is. It’s a shame no one makes them in a 3dr anymore. The dwindling availability of manual transmission options is also a great tragedy. Exacly. In the meantime they became as big as a sedan, heavier, and added two doors in most models. It is normal for younger generations not to catch the difference. They associate name with shape, rather than with philosophy and purpose. A hatchback is a thing. A hot hatch is another thing. Entirely different, except for the “hatch”. Your generation might be one of the last one, during the “morphing” stage from old and new concept. Hatchbacks had some medium-spiced versions. Normally down the range. Like Sport versions of 5 door models (normally you’d have a GTI at the top and a GT down the line, in 3 and 5 doors; an RS on top or an S down, just examples). But not the top models. They were designed for a very peculiar niche of people. Now they are designed for a broader audience MINUS that niche of people. :-). I’d never buy one of these with 5 doors and an automatic transmission. If i live in Beijing and commute from A to B i drive an auto because i don’t want to hurt myself with thousands of useless operations a day, adding stress to my life. If i buy a car to drive it, i don’t need an auto. They are antithetic to what they claim to be, from this perspective. Auto transmissions should have no place in certain segments. That is my opinion. I’m with you, I would never want one with an auto. No thank you!